Feel free to pass this message along to colleagues and encourage them to join us. At any point, you can reach out to massecan@umass.edu with ideas about what our Network should tackle next. Responding to needs identified at last year's Mass ECAN conference, our work group has been busy collaborating with the Open Space Institute and Land Trust Alliance to help conservation practitioners effectively communicate about climate change to different audiences. Currently, we're compiling examples of communication materials, such as newsletter articles, fact sheets, blog posts, that discuss climate change adaptation. These can be from Massachusetts organizations or, for our OSI/LTA collaboration, specifically from land trusts in the Northeast. We'll also be providing streamlined best practices based on social science research and building off a recent report that highlights land trusts' important role in addressing climate change. Stay tuned for the final products later this year! If you have an example or know an organization that is leading on climate communications, please share them with massecan@umass.edu. If you're a communications manager interested in this Work Group, feel free to reach out as well. Over the next couple months, we'll share updates from all the expert work groups! Every month, we'll highlight someone in our community of practice so you can learn about the variety of adaptation work going on and "meet" a new colleague! Bio: Stefanie is passionate about helping communities be more sustainable by implementing targeted conservation and nature-based solutions. As Coordinator for the Shaping the Future of Your Community Program, she helps communities implement sustainable development land use practices through diverse partnerships and encourages systems-thinking approaches that are cost-effective and offer multiple benefits, including climate resilience. (The Shaping program just received an award from the Southeastern Regional Planning and Economic Development District -- Congrats!) Stefanie has a Masters of Environmental Science and Policy from Clark University. She is a certified MVP provider, Keystone Cooperator, and board member for the Massachusetts Water Coalition. Climate change adaptation project she's currently excited about: The Resilient Taunton Watershed Network helps communities achieve not only environmental, but also social and economic resilience. RTWN recognizes that nature-based solutions,such as conserving our landscapes that already provide free ecosystem services, can meet this triple bottom line to help communities adapt to rising seas, increased precipitation, and increased temperatures both today and for future generations. 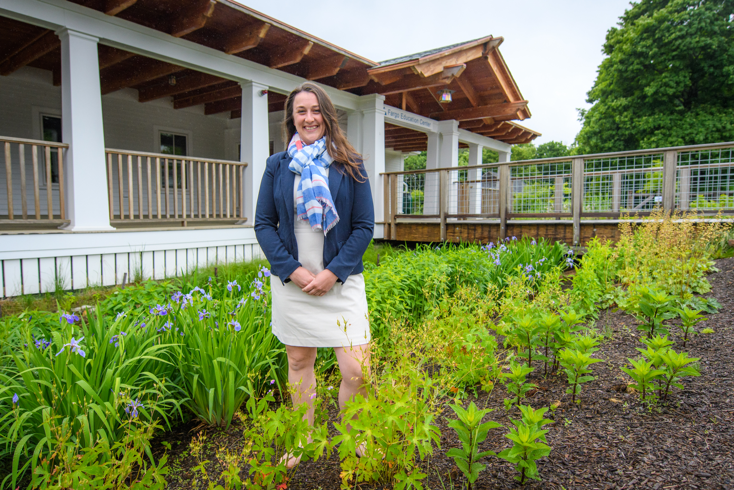 Above: Stefanie standing in a rain garden at her office at Broad Meadow Brook in Worcester, MA that manages all its stormwater onsite. Conference - The National Adaptation Forum call for proposals is now open for Symposia, Training Sessions, Working Groups, Oral Presentations, Posters, and the Tools Cafe. Deadline is Aug. 3rd. I'm Program Co-Chair this year and would love to see many Mass submissions! Hope to see in Madison, WI, April 23-25, 2019! Symposium - Registration is open for the Northeast Regional Invasive Species & Climate Change (RISCC) Management's 2nd annual symposium. Check out the agenda here. Municipal Vulnerability Preparedness (MVP) Training - Become a certified MVP provider! There will be two full day training sessions on July 13 in Westborough and August 8 in the greater metro Boston or central area with final location and logistics tbd. Register for July 13 here and August 8 here. News - MVP Program - The Baker-Polito Administration awarded $5 million in grants as the second phase of the Municipal Vulnerability Preparedness' grant and designation program. Find out more here. News - Environmental Bond Bill - The environmental bond bill cleared the House 143-3 on June 13th and will now move on to the Senate. Read more here. Job Opportunity - Climate & Energy Assistant with Ceres in Boston. Job Opportunity - Program Assistant, Climate and Energy Program, with the Union of Concerned Scientists in Cambridge. Report - The Sustainable Solutions Lab at UMass Boston recently released Feasibility of Harbor-Wide Barrier Systems: Preliminary Analysis for Boston Harbor. The researchers emphasize the importance of continued efforts to increase local, shore-based resiliency efforts that involve neighborhood communities. Adaptive Gradients in the Coastal Environment, an NSF Research Collaboration Network, to help communities consider green infrastructure projects. Report - The DOI Northeast Climate Adaptation Science Center (formerly Northeast Climate Science Center- name change!) released its 2017 Annual Report. Read about completed projects, the new Tribal Climate Science Liaisons, trainings, Fellows’ highlights, and a summary of the Regional Science Meeting. Workshop Proceedings - from the ASAP New England December 2017 Workshop on Funding, Finance, and Investment Solutions for Climate Adaptation, are available here. You are receiving this email because you joined Mass ECAN. Welcome to a new community of practice for climate adaptation practitioners and researchers who are interested in ecosystem resilience and natural resources conservation in Massachusetts. Since launching in October, we've grown to 175 members. Mass ECAN is creating a space for us to learn from and with each other. Together, we can build capacity for climate adaptation that promotes ecosystem resilience and weaves natural resources conservation into actions across sectors.